That’s not a contented sigh, but a rather disappointed one. Disappointed in the book after all these years, and disappointed in myself for not loving it as much as I did as a kid. I think the first time I read Little Women, I was 9 or 10, and I was enthralled, so much so that I reread it several more times before I reached adulthood. Now, it’s been many years since the last time I read it, and when a fellow book club member chose it as our November selection, I was excited to have an excuse to read an old favorite. The edition I have (pictured) includes a lengthy introduction which gives a biography of Louisa May Alcott and discusses how the story parallels her real life, as well as analyzes the characters, themes, and mood of the overall story. Basically, Little Women is loosely based on the author’s own adolescence and young adulthood, but it glorifies it. For instance, Mr. March, the father in the story, is absent through a good portion of the book, off doing heroic chaplain work for the Civil War. In real life, Louisa and her three sisters’ father was largely absent, but for far less honorable reasons – mostly he was chasing losing business ventures and leaving his wife and daughters to fend for themselves. The analysis in the introduction also raises some interesting questions, such as: if the family was so poor, why did they have a live-in servant (and I can’t figure out if Hannah, the servant, is black or white; the story takes place during the Civil War . . . the Marches are Yankees. The story never says whether Hannah is black or white, and I always assumed she was white, but when she is shown to speak in the book, it is with the same stereotypical black dialect of the period)? And, was Jo and/or Louisa herself a lesbian? Jo is the character the author created to represent herself, and though in the end Jo marries, throughout the story she disdains all things feminine and acts as much like a boy as she can get away with, and truly wishes to be a boy, and is mostly repelled by the idea of marriage and romantic love. In actuality, Louisa May Alcott never married. Just interesting things to wonder about. 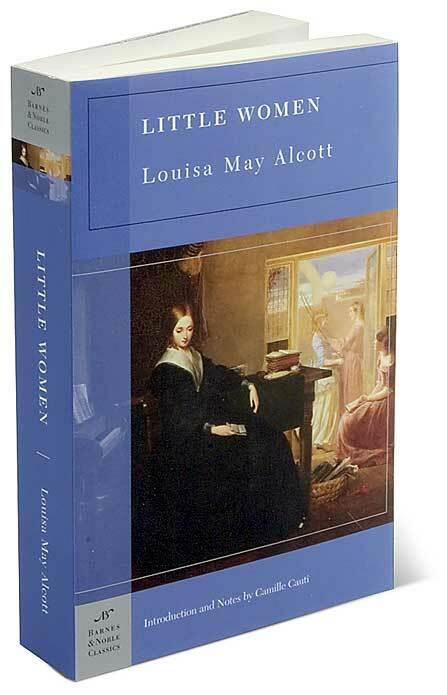 Little Women was originally published in two parts in 1868 and 1869, and combined into the single volume most well-known today in 1880. So it goes without saying that the writing style – descriptions, conversations, etc. – is reflective of that era. The first word that comes to mind to describe the story as I read it now, as opposed to when I read it as a young girl, is tedious. Everything seemed to run on for far too long, with too much detail, and all in a Victorian landscape that, frankly, bored me. The story itself, if you aren’t familiar with it, is of four sisters in adolescence during the Civil War, and the trials and tribulations they undergo over a ten-year period. Jo (short for Josephine) is at the heart of the story. With each of them we see evolution of character, but they’re all so saintly and pious, it was hard for me to swallow. While they get into scrapes and face moral dilemmas, the entire story seems to revolve around these four girls being as virtuous as humanly possible. I know as a girl, I thought Jo quite the heroine – a rebel for her time, she flies in the face of propriety by cutting her hair short, whistling and running about like a boy, and using slang (gasp!). Now, in my jaded adult state, it all seems very silly and frivolous. I still liked Jo the best of all the sisters, but wish she could have truly broken free of the confinements she found herself in by the time period and by the author who rendered her. When death visits the family, I didn’t shed a tear, probably because I knew it was coming from having previously read the story, and because, well, it just didn’t move me now like it did way back when. I read about the first 1/3 word for word, then found myself skimming here and there, and finally, at a little more than halfway through, I cast it aside and took up the remainder in an abridged children’s version my daughters have. I don’t feel bad about it since I did read the book in its entirety more than once, even if it was many, many moons ago. So, I guess my final thoughts are that some books just don’t hold the same magic when revisited a long time later. Little Women was originally written with a juvenile audience in mind, and I think that might be the best audience to read it.